The three-part travelling exhibition Verschwindende Vermächtnisse: Die Welt als Wald [Disappearing Legacies: The World as Forest] presents contemporary artworks and curatorial assemblages that renounce a romantic notion of untouched nature. 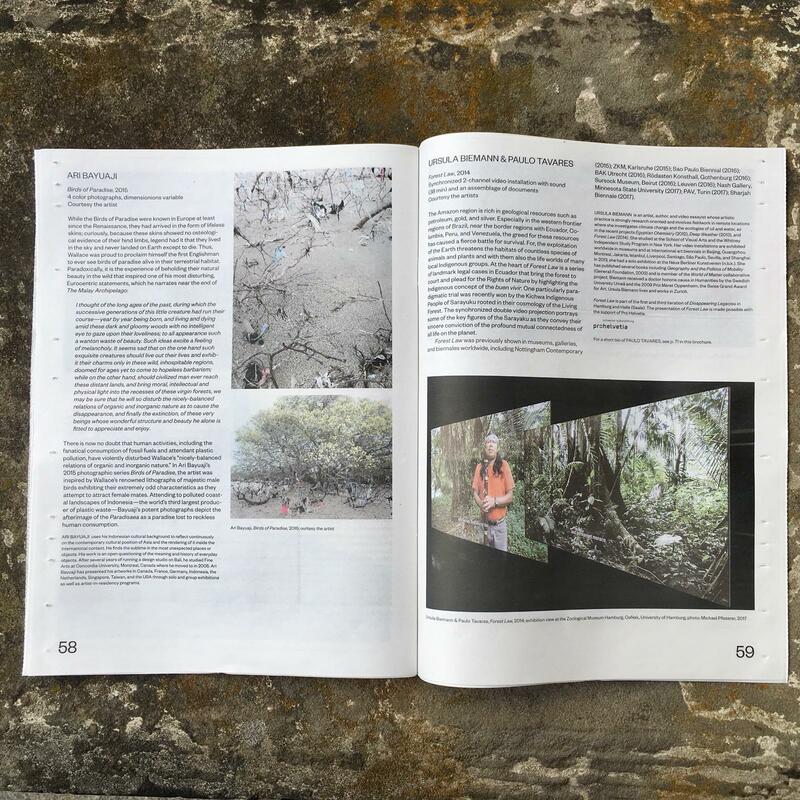 Fifteen installations, photographs, sculptures, and moving-image works—including eight newly commissioned projects—draw connections between Alfred Russel Wallace’s nineteenth-century expeditions to Amazonia and Southeast Asia and current urgencies of environmental transformation. Although the exhibition follows certain historical traces and archival records, Disappearing Legacies is not a “great man of science” biographical retrospective. 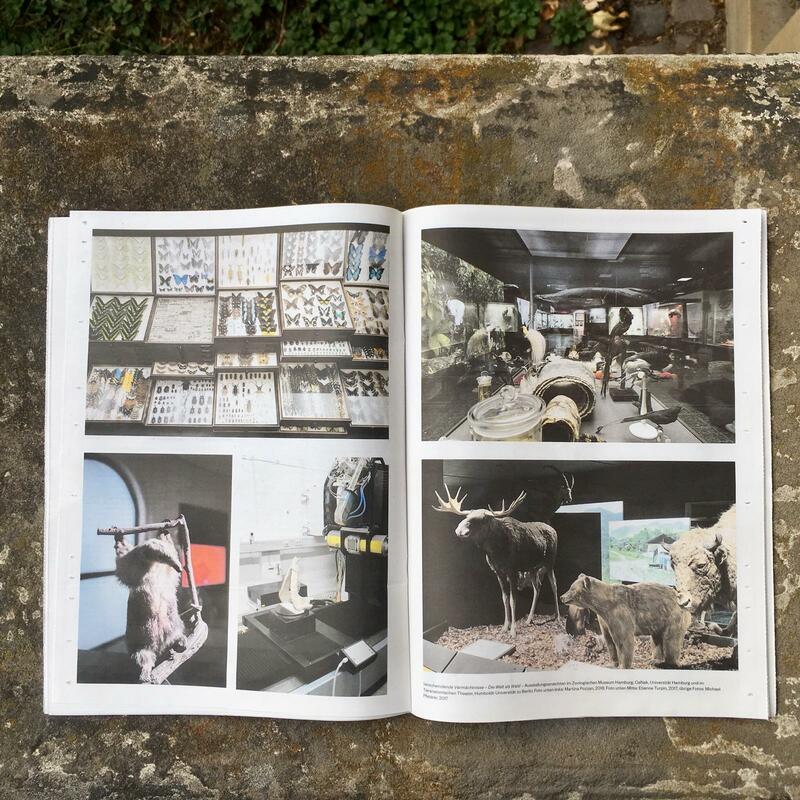 However, by appropriating certain formal elements of this exhibition trope, the project instead considers how colonial natural history collections can be mobilized, disassembled, framed, and read in ways that enable a discussion of urgent ecological and systemic questions of injustice today—whether in the Anthropocene, Capitalocene, or Plantationocene. This is why the exhibition also engages the regions and places where the collection materials (animals, plants, and stories) originate, drawing attention to progressive, transcultural, and decolonizing practices. 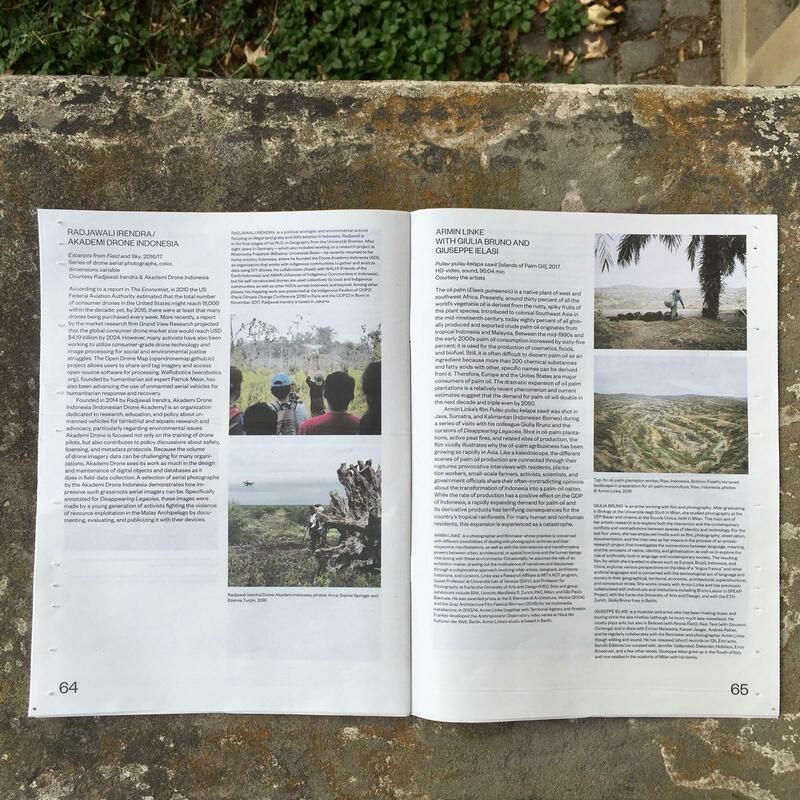 Can—and if so, how can—a colonial archive become a point of departure for a conversation about other ways of knowing, reading, and sensing the heterogeneity of nature as it is voiced by international artists, scientists, and activists? In response to this question, the exhibition celebrates diversity and biodiversity, challenging aesthetic and agricultural monocultures by interrogating the modern colonial legacies that perpetuate epistemicide and ecocide. What kinds of narration can we re-activate or invent? Which human and non-human ways of life are fostered, cultivated, or engendered elsewhere, and how can we support these in defiance of the continued impoverishment of the world? 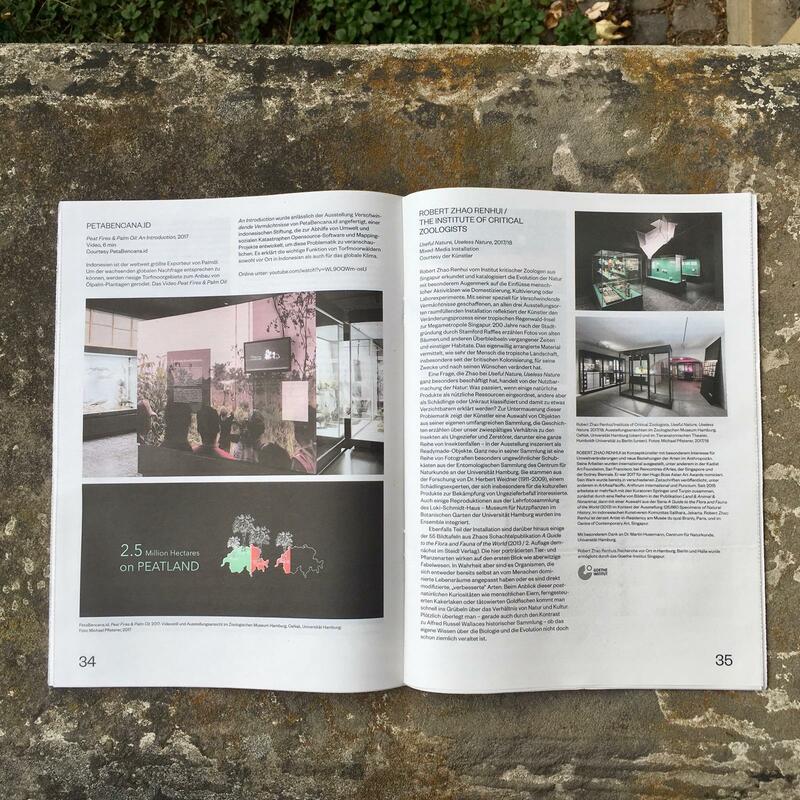 The free exhibition is accompanied by a free guide in broadsheet format. 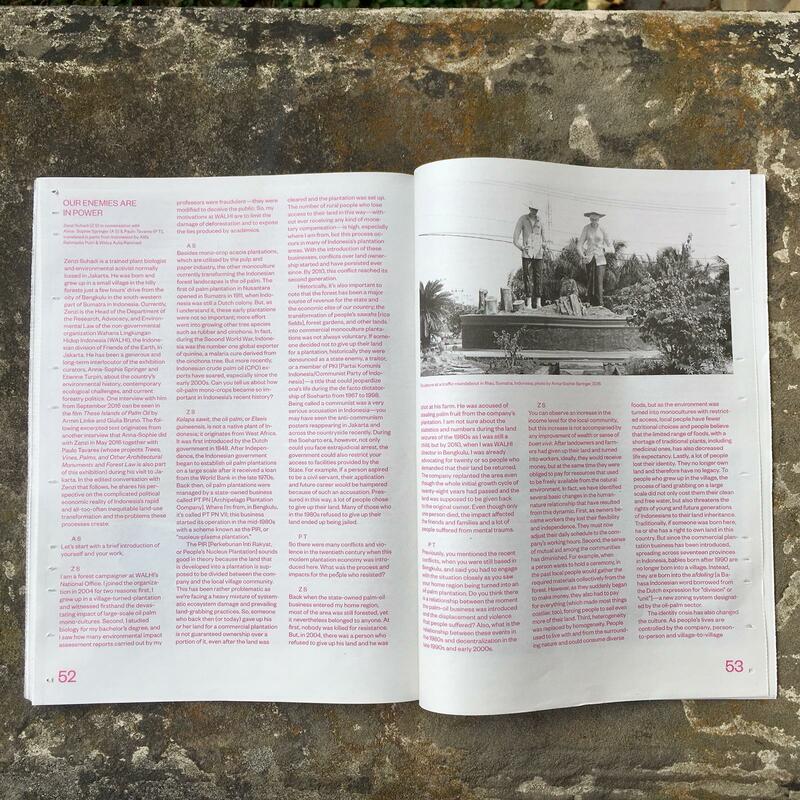 This publication offers contextualizations of all participating artists and their works as well as a selection of related essays and interviews; a special highlight is a German translation of anthropologist Anna Tsing's thought-provoking essay "Earth Stalked by Man: A Feminist Approach to the Anthropocene." A PDF version of the publication is here. 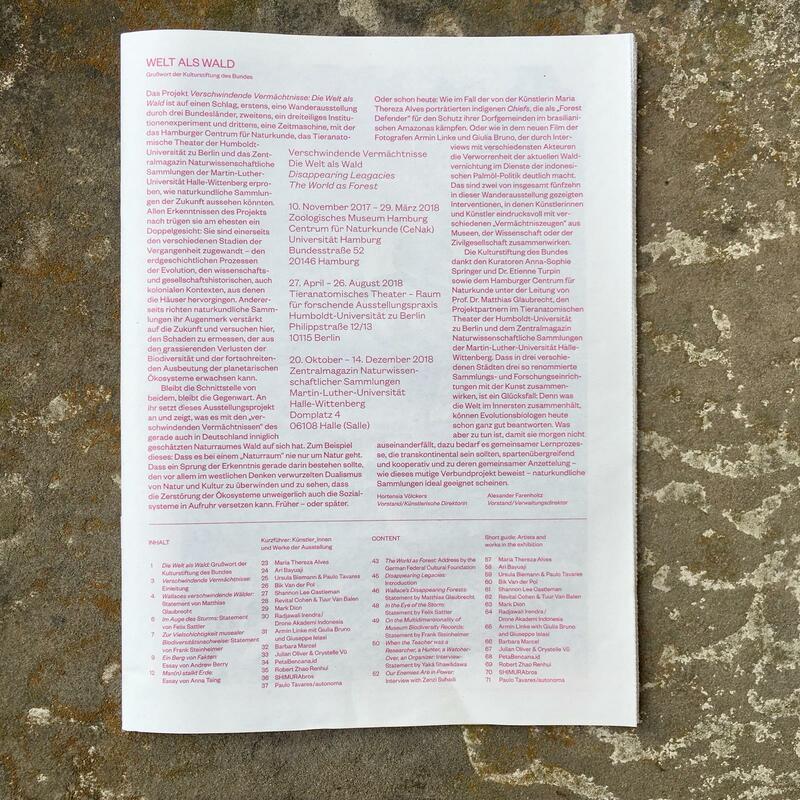 Exhibition guide with additional contributions by Maria Thereza Alves, Andrew Berry, Matthias Glaubrecht, Felix Sattler, Anna-Sophie Springer & Etienne Turpin, Frank Steinheimer, Zenzi Suhadi, Paulo Tavares, Anna Tsing. German translations by Anna-Sophie Springer & Monika Springer. Design by Wolfgang Hückel & Katharina Tauer. The exhibition guide is made possible with the kind support of the Graham Foundation. 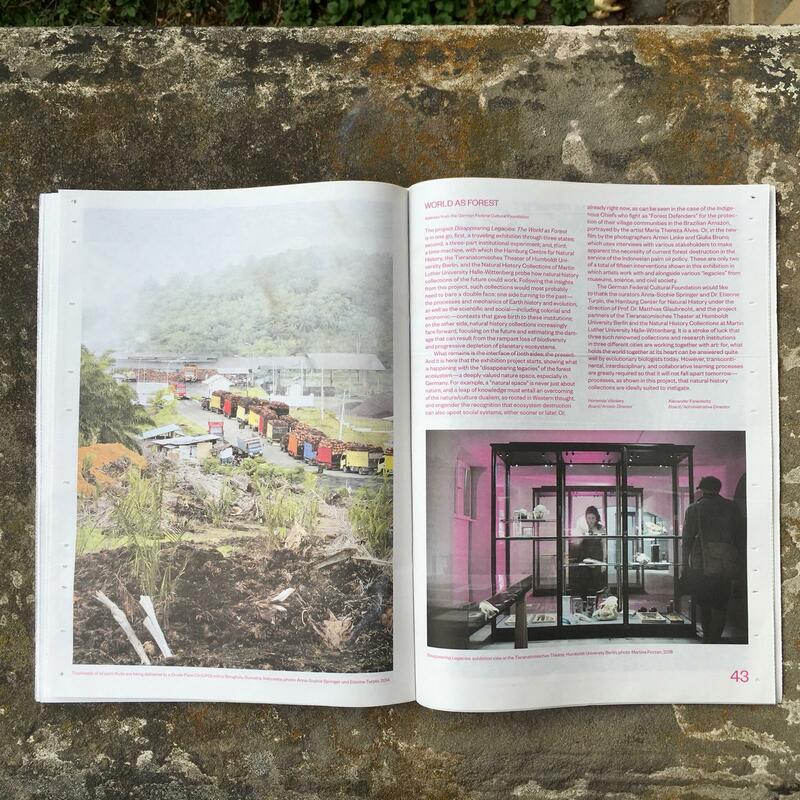 Disappearing Legacies: The World as Forest is a three-part project by Anna-Sophie Springer and Etienne Turpin. The travelling exhibition is realized by Centrum für Naturkunde at the University of Hamburg, where it was on view in the Fall of 2017. 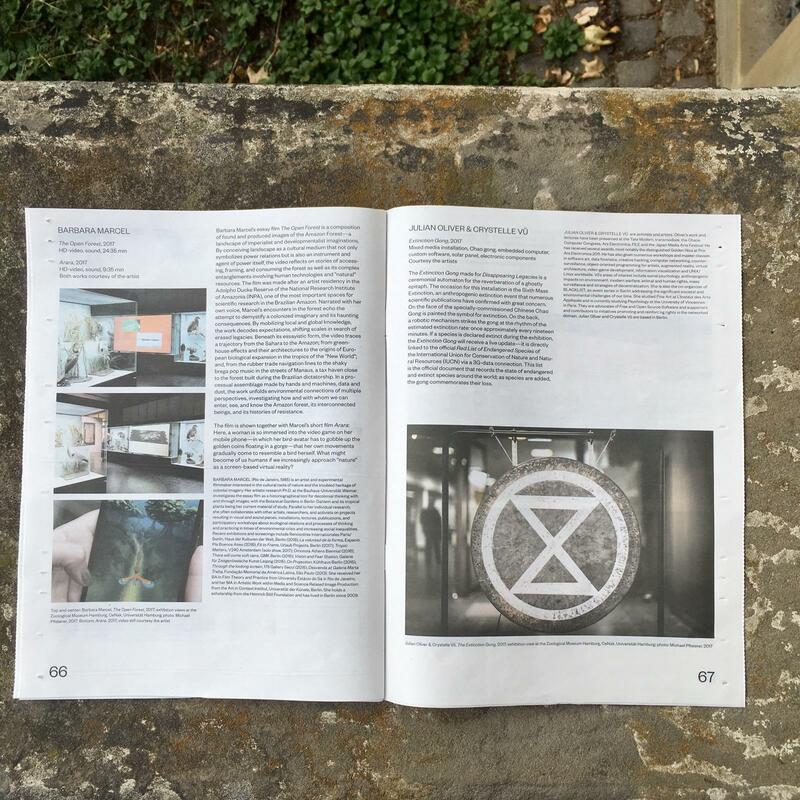 In 2018, adapted iterations are presented, from 27 April to 26 August 2018, at the project partner, Tieranatomische Theater at Humboldt University in Berlin, and, from 19 October until 14 December 2018, at the Zentralmagazin Naturwissenschaftlicher Sammlungen of the Martin-Luther-Universität Halle-Wittenberg in Halle/Saale. The exhibition cycle is a cooperation with the Schering Stiftung and the Goethe-Institut Singapore. The project is funded by the German Federal Cultural Foundation.